As an action, a player can choose one of the newly drawn, face-up tiles and start an auction for it by placing one of their markers on their bid price (1-6). On their turn, any other player can use an action to raise a bid (max price 6). If a player is still the highest bidder, they can use an action to buy that tile. Also, a player can use an action to immediately buy any face-up tile (whether being auctioned or not) for 7 cash. At the start of each round (and when bought), empty vine tiles have a matching colour cube placed on them representing grapes ready for harvest. 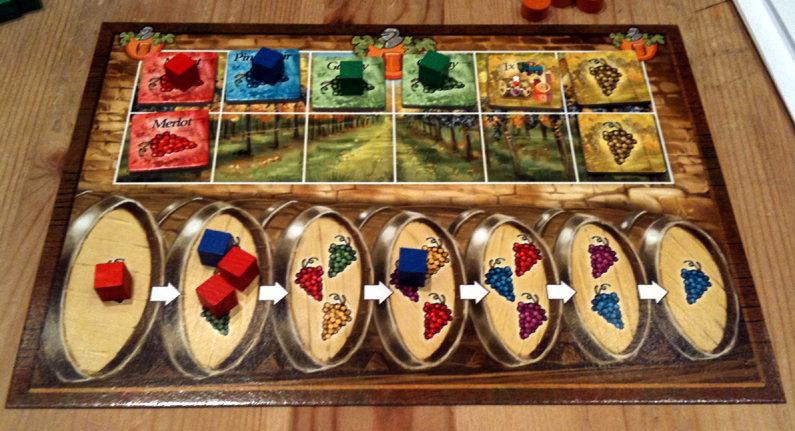 When one tile is harvested to become wine (an action), the cube is placed on the left-most barrel on the player’s board (see image below). 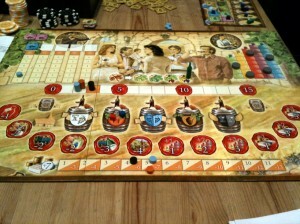 At the end of each round, all the wine in the players’ barrels moves one space to the right showing it is more matured. A wine can only be sold when the wine cube’s colour matches one of the colours on its barrel space. So, each colour wine takes a different amount of time before it is ready for sale; however, the wine that matures faster is also the least valuable. A player can use an action to sell all the wine of one colour from one barrel. This is almost the only way to earn money. Each colour wine has its own price (shown on a chart) and this can go up (a player action) as well as down (when a player sells wine). When any one player harvests their last cube, the other players get 1 more action and the round ends. Prestige points are awarded to players that sold the most wine of each type. These points can then be spent on the special prestige actions shown on the game board which give 1 more sale, 1 more harvest, sell wine before it matures (at lower value), get cash, raise prices, etc. However, only one player can use each prestige action each round. It’s the final round when any 1 player pays off all their loans (or needs to take out more than 11 loans). Players add up their cash (receiving 5 cash for every different type of tile plus 1 cash for every unsold wine cube). After paying off any remaining loans, the player with the most cash wins. 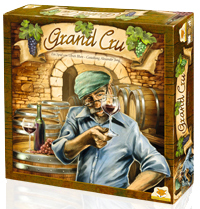 Overall, Grand Cru is a relatively simple game but it is a very tight game and can be unforgiving. Not only is money tight but the amount of actions you get are very tight too. Players always get at least 4 actions each round but the end of a round can be triggered at any time after that so you need to keep an eye on how many vines your opponents have yet to harvest so you earn money as well as develop your vineyard, influence prices and harvest more grapes to sell later. Players must balance lots of items: They want cash now but quick gains are smaller. Specialising in one type of wine is cost effective and has prestige benefits but diversity gives bonuses at the game end. Cash flow management is crucial as you want to invest in a way that will give regular income. This requires lots of decisions and quick planning. The variable number of actions each round is a very interesting game mechanic. It adds some difficult decisions: High reward plans which need time versus more certain but lower reward plans? However, the end of round system also allows players with smaller vineyards (few tiles) to compete because they can end a round quickly and, therefore, limit the amount that larger vineyard players can accomplish. I liked the design of this built-in balancing. The special action tiles can be very useful indeed (sell twice, harvest twice, sell at max price, etc.) but you need to buy those that compliment your vineyard. For example, one lets you raise 3 prices in one action and it’s excellent if you monopolise one wine colour as this gets you great prices and benefits no-one else. The special action that matures the wine in your barrels faster is great for players with longer maturing wines but not for players with wines that mature quickly. The prestige system is interesting. It could easily have unbalanced the game by allowing players that perform well to get extra bonuses too, whilst leaving poor performing players no other options. However, as each prestige action can only be used by one player each round, there’s a limit to what each player can accomplish. Also, the prestige system adds extra structure and goals to each game because it makes players compete over producing amounts of different colours of wine too, which adds to the competition between them. The auction system works well. Being outbid is annoying as you’ll need to use another action to bid higher or accept the previous bid action was wasted. Players need to be careful not to lose multiple actions by getting caught in a bidding war. I didn’t see any major negatives in Grand Cru. Players that don’t like tight economic games where careful action selection is required won’t like it so it’s definitely more for experienced gamers than the casual gamer. The one aspect I wasn’t keen on was that any player can bid any amount in an auction without any penalty if they don’t buy it at the end of a round. My problem with this is that any player can bid 6 (the maximum bid) for a tile even if they have no intention of purchasing it and they do it just to deny another player (or make them pay 7 for it). This makes it easy to block auction purchases (or make prices very high) at the cost of a single action. 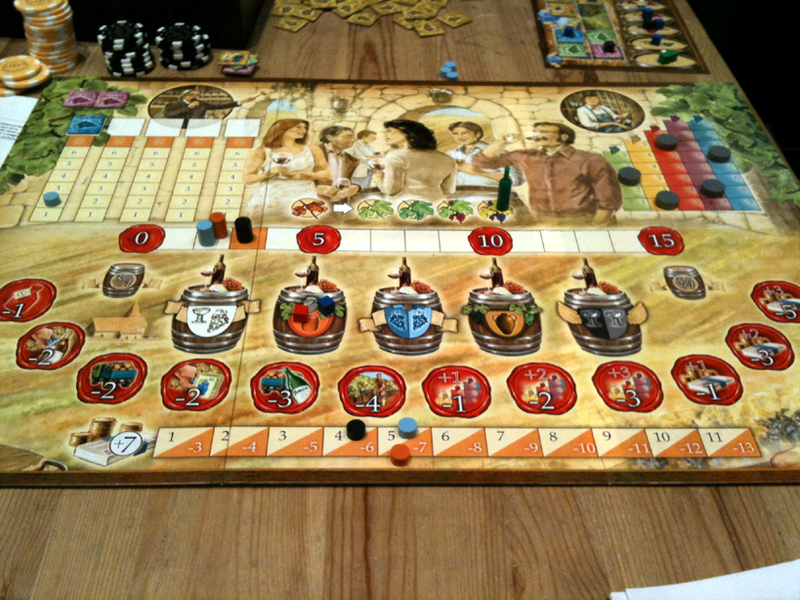 Apart from that the only other minor points were that the the main art of people drinking on the board is a bit weak (but the rest is nice) and the money is paper money which I always find way too fiddly. Grand Cru starts very slowly as you start with nothing but gains speed after a few rounds as you have more vines, more sales and more options. I can imagine that games can be quite different as a lot depends upon the mixture of tiles that enter the game through the auctions and the mixtures and overlaps of wine ownership amongst the players. You always feel like you need more actions – which is usually a good sign in a game. Players who like tight, thinking games should give it a play. This entry was posted on Monday, December 20th, 2010 at 7:52 pm	and is filed under Board Game Review, Board Games, Essen Spiel 10, Grand Cru. You can follow any responses to this entry through the RSS 2.0 feed. You can leave a response, or trackback from your own site.